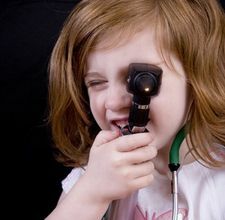 with students and residents rounding on the next case, a pigtailed six year old girl swinging her gangly legs off the exam table. When a resident asks the girl’s mother about her daughter’s past medical history, the attending suggests, “Why don’t you ask the patient?” The child begins chattering knowledgeably about surgeries and chronic infections, as her white–coated audience scrambles to write it all down. Pulling an instrument from his pocket the resident says in a sugary voice, “Sweetie, I’m going to shine this little flashlight in your ear.” The girl patiently explains, “That’s called an otoscope.” That girl was me. Growing up, I was literally the poster child for St. Louis Children’s Hospital. My image appeared in their pamphlets, television commercials, and many research presentations. Many of my earliest memories are from hospital stays. I was born with a cleft lip and palate and suffered from many of the chronic ENT problems that are often associated with this condition. I was lucky enough to be followed by a team of physicians. The caregivers I remember most are the ones who included me in the conversation, who never condescended, who were always honest with me, who took the time to listen as well as speak, even when I was six. While doctors in the press, like Paul Farmer, Atul Gawande, or Jerome Groopman have certainly captured my interest as an adult, my main inspirations are my general practitioners. They have listened, cajoled, and lectured in turns when I needed it. My parents set up a lab for me in the basement where I did experiments and took things apart to figure out how they worked. I was (and still am) proud of my fossil collection, which my dad and I dug up ourselves down the street from Six Flags Over Great America. I could hear the kids screaming on the roller coaster, and took it as proof that I was having way more fun! 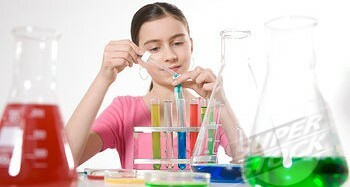 Science fair time was an anticipated event in my household, and I always tried to outdo my previous year’s efforts. In high school, I placed third at the tri-state competition! Due to my active imagination, high energy level, and excitability, my parents also enrolled me in a preschool drama class that led to years of school plays, reading Shakespeare for fun in fifth grade, and theater camp every summer until college. 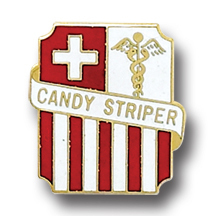 Many high schools have a service requirement, and I chose to spend more time in a hospital as a candy striper (complete with the 1950s itchy outfit). The patients I met profoundly changed the way I saw medicine. Before high school, I thought of medicine as the science of “curing” people. Then I met the patients on the oncology and cardiology floors who were happy to just have a few more years of life. Some were mad, depressed, or in denial about their prognosis. Others were peaceful, resilient, hopeful, or determined to get well. These patients in the latter category spoke of their doctors by first name, as if they felt they were partners. They were empowered. I ultimately decided to study theater and English in college. The plan was to also squeeze in the prerequisite pre-med courses, but theater is so all-consuming that the plan soon fell to the wayside. And here I am, ten years later, picking up where I left off. I hope I am wiser; I know I’ve been shaped by my experiences in the years since, and I am grateful for all I have had the opportunity to do, learn, and see. How did you get started? Can you trace your origin story? The opportunity to come back to an initial passion is rare; I know because it’s what’s happened to me. I’ve wanted to be a writer since 4th grade, but was near 30 before I began pursuing it seriously. After a few successes, life got in the way again and now, just north of 50, I’ve another chance. Everyone should be as lucky as we’ve been and–the rest of you out there–if you haven’t yet, don’t give up the dream. What an awesome bio and what awesome parents! I especially love your opening paragraph which ends, “That girl was me.” Speaking of service requirements for high schools, I was just telling a friend the other day that I thought all high schools should have a service requirement. I love your blog and I’ll be back! Thank you Sandy! I was very lucky to have such creative parents. This post is part of a rough draft of my personal essay for post-bacc pre-med programs, so I am thrilled you like the opening! I’ll keep it in for sure. Service was required at both high schools I attended, though to be fair, they were catholic schools. I know it is a growing trend in public high schools around the greater Boston area. I’m in favor of having a mandated year of service after high school, or at least a program that offers student loans, in return for a year of service to organizations like City Year. Stay tuned for some upcoming posts about talking to kids about emergencies, and how they can be active participants/helpers! Michael, I’m so glad you are finally getting to take up your passion again! My dad has been writing a children’s chapter book since I was little (the story he used to tell me and my sister), and in his retirement, he’s been able to get a full polished draft! It’s NEVER too late. Grandma Moses didn’t start painting until her 70s. I’m not your target audience. 😉 But came across you blog and thought I’d let you know what a lovely picture you paint in this autobiography. I’m jealous of your childhood (almost!). Thanks Tegan! I’m glad you found something to enjoy, and thank you for commenting. I will be sure to point my dog-owning friends your way.